NB : search on dota dictionary if you doesn't know what the meaning of. Nuking enemy with his Overpower skill. Easy to use, recommend for newbie who want to become carry/killer. Easy to avoided him. We can use ghost sceptre or blade mail. 1. Earth Shock : Slams the ground, dealing damage to and slowing the movement speed of nearby enemy land units. 4 seconds duration. 75 Mana cost. 2. 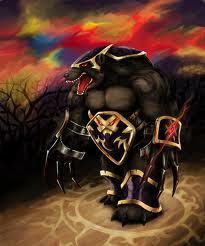 Over Power: Sends Ulfsaar into a rage until he can expend his energy on a target. 400% increased attck speed. Last up to 15 seconds or when his attack limit is reached. 3.Fury Swipes : Each attack opens the wound deeper in the target, causing subsequent attacks to deal increased damage. Duration 5 seconds. NB: Passive.15/20/25/30 bonus per attack. Orb effect do not stuck. Pure bonus damage. 4.Enrage: When activated, greatly increases Ulfsaar's damage based on his current life. 15 seconds duration. 25 seconds cooldown. NB: Level 1 - 5%/6%/7% of Ulfsaar's current life is dealt in damage. Pick Ursa if you are newbie, you like to kill, you love to farms in neutral creeps. Don't pick Ursa if your ally need a good carry. You can go anywhere you like in the lane. Try to go with Support Hero. It is hard for ursa to farming in the first minute. But if your ally is Pro, You can easily "first blood"ing your enemy. Remember to buy Boot of speed first if you try to kill enemy. Just play save and pull your creep into neutral creeps. In early game, you must decided what roles its suitable with the gameplay. If your enemy have many INT heroes / Heroes with low HP, Ganker is suited best. If your enemy have many Tanker heroes, try to become Semi Carry. This roles decided your item and how you play Ursa. Farming in the lane will hard for you because your enemy is range hitter(INT hero usually Range). Just try to farming on the neutral creeps, and try to ganking sometimes(best if you mobile to another lane too). Remember to ganking enemy with a less disabler skill :D.
If your enemy have many Tanker heroes, believe me they will focus on making blade mail. So Semi-Carry is your roles, Try to ganking another enemy which have low HP, and build your item faster then your enemy. When in mid game, the second roles will decided on. Initiator or Ganker. When your ally doesn't have hero that can Initating, Kellen of Dagger's will helped you out. If you think that isn't important, you can buy Lothar. Use Overpower and in one second your enemy will die XD. It is very easy, right? Ursa is Semi-Carry so it depended on its item. When on war, try to Blink with dagger / windwalk with lothar to enemy's disabler first. It will more easy if you have BkB. That's all for Ursa DotA Guide. Enjoy DotA Gamers ! Subscribe us for another hero and item guide, DotA AI map, and latest thing about DotA.